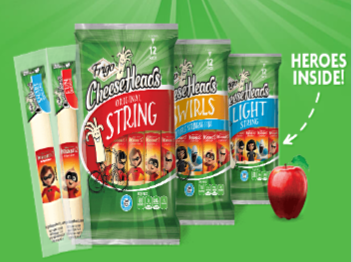 Frigo Cheese Heads® Make Back to School Incredible Game – Win a $50 Visa gift card & more! Win an Incredibles 2 backpack and a $50 Visa gift card (100 winners)! ENTRY LIMIT – Limit one (1) Game Play per person per e-mail per day during the Entry Period. ELIGIBILITY – : Promotion is open to all legal US residents physically residing in the 50 United States and District of Columbia who are 18 years of age or older, as of the date of entry, and have reached the age of majority in the state of residence. SWEEPSTAKES ENTRY PERIOD – The Saputo Cheese USA Inc. Frigo® Cheese Heads® Make Back to School Incredible Game starts at 12:00:01 PM Eastern Time (“ET”) on August 15, 2018, and ends at 11:59:59 PM ET on November 15, 2018. PRIZES – One hundred (100) grand prize winners (each a “Grand Prize Winner”) will receive an Incredibles 2 Backpack and a $50 Visa® Gift Card (“Grand Prize”). The approximate retail value (“ARV”) of each Grand Prize is $74.95. Three hundred fifty (350) first prize winners (each a “First Prize Winner”) will receive an Incredibles 2 Lunch Kit (“First Prize”). The ARV of each First Prize is $9.99. Seven hundred (700) second prize winners (each a “Second Prize Winner”) will receive an Incredibles 2 Tumbler (“Second Prize”). The ARV of each Second Prize is $5.99. WINNER’S LIST – To request the name of the prize winners, please send a self-addressed, stamped, business-size envelope by December 31, 2018, to: “Frigo® Cheese Heads® Make Back To School Incredible Game ” Winner List Request, Saputo Cheese USA Inc., One Overlook Point, Suite 300, Lincolnshire Corporate Center, Lincolnshire, IL 60069.